This is the main issue today. As we mark the 24th anniversary of Gazeta Wyborcza we ask the question that keeps cropping up in Polish debates.Â Right from the start, our paper has aimed to serve a democratic, tolerant and European Poland. So where does this question come from? The answer seems simple. Fascism of the 1930s no longer exists because the context has changed: there is no HitlerÂs Germany, MussoliniÂs Italy, StalinÂs Soviet Russia, no civil war in Spain, no ONR that tried to impose a numerus clausus on universities. What does fascism actually mean? I remember discussions about what Hitler was and whether he was a fascist, like Mussolini, or a national socialist. Whether Milošević was a communist or a fascist chauvinist advocating a Greater Serbia. Whether Chávez is a Latin American Bolshevik of a Castro bent, or a fascist modelled on Perón? Over the past few decades a new phenomenon has emerged, a peculiar synthesis of nationalism and xenophobia with anti-market populism exploiting egalitarian and anti-capitalist clichés. In many countries this idea has managed to mobilize the crowds. Fans of the former “brown” formations have allied themselves with the spiritual heirs of the “reds”. Russia is a good example. Zyuganov has defined the essence of these weird alliances that have been springing up in Serbia, Ukraine, Romania and Hungary. And in Poland, too. What unites these apparently contradictory components is their disdain for the institutions and customs of liberal democracy as well as an appreciation of movements with strong leaders and the authoritarian state. There’s nothing new in this. Back in the 1930s there were already people who perceived Nazism as national bolshevism, and compared Stalin to fascist leaders. But rebels whose posturing merited scorn. Who resurrected the word of Bolesław the Brave? Who drove pillars into the bottom of the Oder? Was to blow on the coals of national passions? This was a prophetic prediction of the spiritual coalition between the communist Mieczysław Moczar and fascist Bolesław Piasecki; a prediction of the Patriotic Grunwald Association, which united both of these components. And wasn’t the so-called Fourth Republic, based on an alliance of three formations – post-Solidarity, post-communist and post-fascist – a portent of things to come? Just like the rhetoric in which religion is politicized, screaming replaces dialogue and emotions replace reason. And don’t the hate-filled words addressed to the democratic government, uttered by right-wing politicians and journalists, by Radio Maryja, by Duda, the leader of the Solidarity Trade Union, portend an authoritarian and intolerant Poland? Democracy is the art of compromise and pluralism, while authoritarianism is the art of war and diktat. These are the skills the present-day enemies of liberal values have cultivated to a high degree. This is not fascism, it is an original project, albeit one that builds on the stereotypes and practices of the 1930s. Every sphere of life is judged from the point of view of the party’s interest. It relies on a permanent mobilisation of one’s own camp against ethical values, scholarship and the arts. The past is recreated and constructed out of lies. That is why the future, too, is built on lies. These people know no compromise. The row about in vitro fertilisation has been transformed into a total ideological and religious war. The row about Father Rydzyk’s TV Trwam is a war against the enemy who is intent on a biological extermination of the Polish nation. Father Rydzyk’s demon is the spirit of European liberalism, his medium being a war against a lethal threat, against a treacherous Prime Minister supposedly responsible for Lech Kaczyński’s assassination; a war waged against President “Komoruski” as banners of fanaticized protesters will have it. They know how to lie and enthrall. Castro has deceived the world for decades about the true nature of his regime. Those deceived included distinguished figures in arts and science. Today Gazeta Wyborcza awards the title Woman of the Year to Yoani Sánchez, a brave and wise Cuban blogger, who has challenged the dictator. Her presence is also a challenge to us. We are grateful to her and wish to serve the same values that she stands for. 40 years ago Ryszard Krynicki wrote that “the fascists are changing their shirts”. LetÂs not fall for this trick. Only stubborn resistance will protect us from a return to power of those people who – although the label “fascist” makes them cringe – rely heavily on fascist stereotypes and manipulation techniques. Poland is too good for people like these. 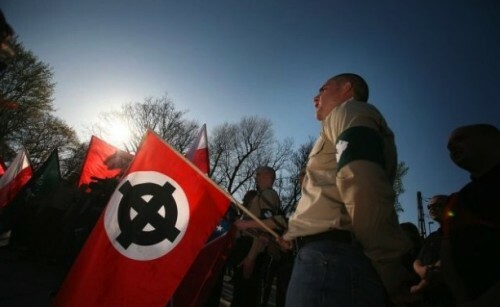 The National Radical Camp (Obóz Narodowo-Radykalny, ONR), a nationalist and anti-semitic movement founded in 1934, which was banned after three months by the government. A Treatise on Poetry. Translated into English by Czesław Miłosz and Robert Hass. The Patriotic Grunwald Association (Zjednoczenie Patriotyczne “Grunwald“) was a movement of activists of a nationalist bent, supporters of the Polish People’s Republic of the 1980s, which was active from 1981 to 1995. Fourth Republic (IV Rzeczpospolita or IV RP), is a political slogan coined by supporters of the Kaczyński brothers’ Law and Justice Party during the 2005 election campaign. It demanded a fundamental change in the country’s order, specifically the Third Republic, i.e. the post-communist governments that emerged from the agreements of the May 1989 Round Table discussions.